Tom Wolfe argues that what we think we know about speech and human evolution is wrong, focusing on a critique of Charles Darwin and Noam Chomsky. ...a whooping, joy-filled and hyperbolic raid on, of all things, the theory of evolution ... Because this is a Tom Wolfe production, there is a great deal of funny and acid commentary on social class ... Mr. Wolfe’s prose here is mostly sure-footed, but there are moments when he seems on the verge of losing it, of falling into fragments of Morse-code nonsense ... The Kingdom of Speech is meant to be a provocation rather than a dissertation. The sound it makes is that of a lively mind having a very good time, and enjoying the scent of its own cold-brewed napalm in the morning. Wolfe makes a habit of turning all the 'great men' of history into straw men ... New Journalism was about the author asserting himself in the story by becoming a part of it. But when Wolfe stays in his chair, he becomes just another elderly man shouting at his computer. 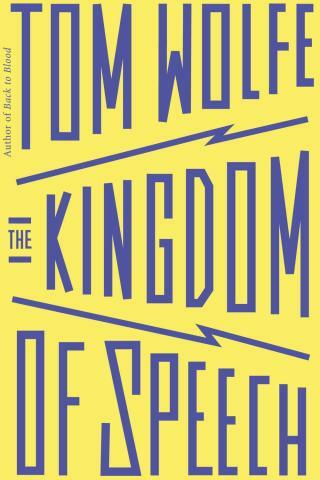 This is not entirely a bad thing — nobody shouts at his computer quite like Tom Wolfe ... I’m pretty sure The Kingdom of Speech is what used to be known as 'a hoot.' Never have I been so entertained by such a shoddy argument. Sadly, his latest book, The Kingdom of Speech, suffers from [a] mix of sarcasm and ignorance ... Wolfe’s argument ultimately backfires, for the book grossly distorts the theory of evolution, the claims of linguistics and the controversies about their connection. Finally, after misleading the reader for nearly 200 pages, Wolfe proposes his own theory of how language began — a theory far less plausible than the ones he mocks. What did you think of The Kingdom of Speech?